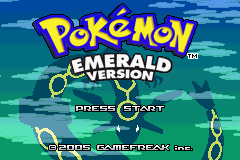 The “third” version of Ruby and Sapphire, Emerald’s revisions to the game itself aren’t many. But what there was changed a lot. The plot was changed to basically bind both games together making for what is quite honestly a more realistic scenario between the teams. The PokeGear’s Trainer’s Eyes was swapped for Match Call, which behaves more like Gold/Silver/Crystal’s Cell Card in that you can call trainers and they would call you periodically, except you can store unlimited numbers after you defeat a certain trainer. You even get the Gym Leaders’ numbers for rematches! The font was also changed for a much better looking alternative to the ugly R/S one. Various gameplay enhancements were done as well: More trainers were added and you can now be challenged by two trainers at one time which results in a double battle, this makes for a refreshing change from time to time. A lot of the more important fights have been revamped to be a bit harder too, and with a few creative surprises. But the biggest addition of all? This was the debut of the Battle Frontier, one of the best postgame ideas to come out in nearly any game at all. R/S’s Battle Tower was expanded more than tenfold, bringing in battle modes no one ever thought would exist before now: battles that randomly pick Pokemon, random dungeons (sort of), matches that completely depend on your Pokemon’s happiness and personality, you name it. Winning battle runs earn you BP, which you can use on Move Tutors and other items. If you’re not sure about these, all the Pokemon contests (except for one, which is now the hub for all of them) have been replaced with Battle Tents that act as mini versions of three of the events. Pokemon Emerald won’t teach you to like Hoenn if you didn’t enjoy the previous games, but it’s definitely the best version of it. The Battle Frontier alone is something that can keep you hooked for days on end, raising Pokemon specifically for it.